This article is about the comics created in Japan. For other uses, see Manga (disambiguation). Manga (漫画, Manga) are comics created in Japan or by creators in the Japanese language, conforming to a style developed in Japan in the late 19th century. They have a long and complex pre-history in earlier Japanese art. The term manga (kanji: 漫画; hiragana: まんが; katakana: マンガ; listen ; English /ˈmæŋɡə/ or /ˈmɑːŋɡə/) in Japan is a word used to refer to both comics and cartooning. "Manga" as a term used outside Japan refers to comics originally published in Japan. In Japan, people of all ages read manga. The medium includes works in a broad range of genres: action-adventure, business and commerce, comedy, detective, historical drama, horror, mystery, romance, science fiction and fantasy, sexuality, sports and games, and suspense, among others. Many manga are translated into other languages. Since the 1950s, manga has steadily become a major part of the Japanese publishing industry, representing a ¥406 billion market in Japan in 2007 (approximately $3.6 billion) and ¥420 billion (approximately $5.5 billion) in 2009. Manga have also gained a significant worldwide audience. In Europe and the Middle East the market was worth $250 million in 2012. In 2008, in the U.S. and Canada, the manga market was valued at $175 million; the markets in France and the United States are about the same size. Manga stories are typically printed in black-and-white, although some full-color manga exist (e.g., Colorful). 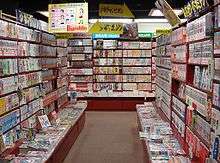 In Japan, manga are usually serialized in large manga magazines, often containing many stories, each presented in a single episode to be continued in the next issue. If the series is successful, collected chapters may be republished in tankōbon volumes, frequently but not exclusively, paperback books. A manga artist (mangaka in Japanese) typically works with a few assistants in a small studio and is associated with a creative editor from a commercial publishing company. If a manga series is popular enough, it may be animated after or even during its run. 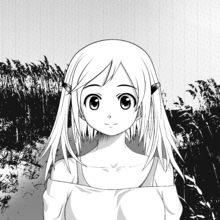 Sometimes manga are drawn centering on previously existing live-action or animated films. The word "manga" comes from the Japanese word 漫画, composed of the two kanji 漫 (man) meaning "whimsical or impromptu" and 画 (ga) meaning "pictures". Modern manga originated in the Occupation (1945–1952) and post-Occupation years (1952–early 1960s), while a previously militaristic and ultra-nationalist Japan rebuilt its political and economic infrastructure. Writers on manga history have described two broad and complementary processes shaping modern manga. One view emphasizes events occurring during and after the U.S. Occupation of Japan (1945–1952), and stresses U.S. cultural influences, including U.S. comics (brought to Japan by the GIs) and images and themes from U.S. television, film, and cartoons (especially Disney). The other view, represented by other writers such as Frederik L. Schodt, Kinko Ito, and Adam L. Kern, stress continuity of Japanese cultural and aesthetic traditions, including pre-war, Meiji, and pre-Meiji culture and art. Regardless of its source, an explosion of artistic creativity certainly occurred in the post-war period, involving manga artists such as Osamu Tezuka (Astro Boy) and Machiko Hasegawa (Sazae-san). Astro Boy quickly became (and remains) immensely popular in Japan and elsewhere, and the anime adaptation of Sazae-san drawing more viewers than any other anime on Japanese television in 2011 . Tezuka and Hasegawa both made stylistic innovations. In Tezuka's "cinematographic" technique, the panels are like a motion picture that reveals details of action bordering on slow motion as well as rapid zooms from distance to close-up shots. This kind of visual dynamism was widely adopted by later manga artists. Hasegawa's focus on daily life and on women's experience also came to characterize later shōjo manga. Between 1950 and 1969, an increasingly large readership for manga emerged in Japan with the solidification of its two main marketing genres, shōnen manga aimed at boys and shōjo manga aimed at girls. Manga for male readers sub-divides according to the age of its intended readership: boys up to 18 years old (shōnen manga) and young men 18 to 30 years old (seinen manga); as well as by content, including action-adventure often involving male heroes, slapstick humor, themes of honor, and sometimes explicit sexuality. The Japanese use different kanji for two closely allied meanings of "seinen"—青年 for "youth, young man" and 成年 for "adult, majority"—the second referring to sexually overt manga aimed at grown men and also called seijin ("adult" 成人) manga. 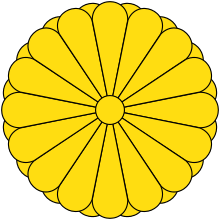 Shōnen, seinen, and seijin manga share many features in common. With the relaxation of censorship in Japan in the 1990s, a wide variety of explicit sexual themes appeared in manga intended for male readers, and correspondingly occur in English translations. However, in 2010 the Tokyo Metropolitan Government passed a bill to restrict harmful content. The gekiga style of drawing—emotionally dark, often starkly realistic, sometimes very violent—focuses on the day-in, day-out grim realities of life, often drawn in gritty and unpretty fashions. Gekiga such as Sampei Shirato's 1959–1962 Chronicles of a Ninja's Military Accomplishments (Ninja Bugeichō) arose in the late 1950s and 1960s partly from left-wing student and working-class political activism and partly from the aesthetic dissatisfaction of young manga artists like Yoshihiro Tatsumi with existing manga. After a series has run for a while, publishers often collect the episodes together and print them in dedicated book-sized volumes, called tankōbon. These can be hardcover, or more usually softcover books, and are the equivalent of U.S. trade paperbacks or graphic novels. These volumes often use higher-quality paper, and are useful to those who want to "catch up" with a series so they can follow it in the magazines or if they find the cost of the weeklies or monthlies to be prohibitive. Recently, "deluxe" versions have also been printed as readers have gotten older and the need for something special grew. Old manga have also been reprinted using somewhat lesser quality paper and sold for 100 yen (about $1 U.S. dollar) each to compete with the used book market. In the following years, manga became increasingly popular, and new publishers entered the field while the established publishers greatly expanded their catalogues. and by 2008, the U.S. and Canadian manga market generated $175 million in annual sales. Simultaneously, mainstream U.S. media began to discuss manga, with articles in The New York Times, Time magazine, The Wall Street Journal, and Wired magazine. ↑ Saira Syed (18 August 2011). "Comic giants battle for readers". BBC News. BBC. Retrieved 16 March 2012. 1 2 Danica Davidson (26 January 2012). "Manga grows in the heart of Europe". Geek Out! CNN. Turner Broadcasting System, Inc. Retrieved 29 January 2012. ↑ "Shiji no yukikai(Japanese National Diet Library)". ↑ "Inu Yasha Ani-MangaGraphic Novels". Animecornerstore.com. 1999-11-01. Archived from the original on 4 December 2010. Retrieved 2010-11-01. ↑ Randal, Bill (2005). "English, For Better or Worse". The Comics Journal (Special ed.). Fantagraphics Books. ↑ Brigid Alverson (February 12, 2014). "Strong French Manga Market Begins to Dip". publishersweekly.com. Retrieved December 14, 2014. ↑ Rich Johnston (January 1, 2014). "French Comics In 2013 – It's Not All Asterix. But Quite A Bit Is.". bleedingcool.com. Retrieved December 14, 2014. ↑ Jennifer Fishbein (27 December 2007). "Europe's Manga Mania". Spiegel Online International. Retrieved 30 January 2012. ↑ Schodt 1996, p. 309, Rifas 2004, Rifas adds that the original EduComics titles were Gen of Hiroshima and I SAW IT [sic]. ↑ Brienza, Casey E. (2009). "Books, Not Comics: Publishing Fields, Globalization, and Japanese Manga in the United States". Publishing Research Quarterly. 25 (2): 101–117. doi:10.1007/s12109-009-9114-2. ↑ Kwok Wah Lau, Jenny (2003). "4". Multiple modernities: cinemas and popular media in transcultural East Asia. Philadelphia: Temple University Press. p. 78. ↑ Obunsha Co.,Ltd. (2014-07-18). 京都精華大学、入試結果 (倍率)、マンガ学科。 (in Japanese). Obunsha Co.,Ltd. Archived from the original on 2014-07-17. Retrieved 2014-07-18. ↑ Kyoto Seika University. "Kyoto Seika University, Faculty of Manga". Kyoto Seika University. Archived from the original on 2014-07-17. Retrieved 2014-07-18. ↑ Shuho Sato; et al. (2012-07-26). 漫画を学校で学ぶ意義とは (in Japanese). togetter. Retrieved 2014-07-19. Bacon, Michelle (14 April 2005). "Tangerine Dreams: Guide to Shoujo Manga and Anime". Retrieved 1 April 2008. Bouquillard, Jocelyn; Marquet, Christophe (1 June 2007). Hokusai: First Manga Master. New York: Abrams. ISBN 0-8109-9341-4. Clements, Jonathan; McCarthy, Helen (2006). The Anime Encyclopedia: A Guide to Japanese Animation Since 1917, Revised and Expanded Edition. Berkeley, California: Stone Bridge Press. ISBN 1-933330-10-4. Mahousu (January 2005). "Les editeurs des mangas". self-published. Retrieved 19 December 2007. Riciputi, Marco (25 October 2007). "Komikazen: European comics go independent". Cafebabel.com. Retrieved 4 March 2008. Shimizu, Isao (June 1985). 日本漫画の事典 : 全国のマンガファンに贈る (Nihon Manga no Jiten – Dictionary of Japanese Manga) (in Japanese). Sun lexica. ISBN 4-385-15586-0. Tai, Elizabeth (23 September 2007). "Manga outside Japan". Star Online. Retrieved 19 December 2007. Toku, Masami (Spring 2006). "Shojo Manga: Girl Power!". Chico Statements. California State University, Chico. ISBN 1-886226-10-5. Retrieved 5 April 2008. Webb, Martin (28 May 2006). "Manga by any other name is...". The Japan Times. Retrieved 5 April 2008. "'Poten': a manga magazine from Kyoto". Kyoto International Manga Museum. Retrieved 21 December 2008. "'Shonen Pakku'; Japan's first children's manga magazine". Kyoto International Manga Museum. Retrieved 21 December 2008. "The first Japanese manga magazine: Eshinbun Nipponchi". Kyoto International Manga Museum. Retrieved 21 December 2008. "Un poil de culture – Une introduction à l'animation japonaise" (in French). 11 July 2007. (Italian) Marcella Zaccagnino and Sebastiano Contrari. "Manga: il Giappone alla conquista del mondo" (Archive) Limes, rivista italiana di geopolitica. 31/10/2007.